"Allen key" redirects here. For the American politician, see Alan Keyes. For the computer scientist, see Alan Kay. For the telephone button, see Number sign. A hex key, Allen wrench or Allen key, is a simple tool used to drive bolts and screws with hexagonal sockets in their heads. The tool is usually formed of a single piece of hexagonal rod of hard steel, with blunt ends that are meant to fit snugly into the screw's socket, bent in an "L" shape with unequal arms. The tool is usually held and twisted by the long arm, creating a large torque at the tip of the short arm. Reversing the tool lets the long arm reach screws in hard-to-reach places. Each key is meant to be used with screws of a specific socket size, with rather tight tolerances; so the tool is commonly sold in kits that include half a dozen or more keys of different sizes. Usually the size of the key increases with the size of the socket, but not necessarily in direct proportion. Variants of the tool have the short end inserted in a transverse handle, which may contain multiple keys that can be folded into the handle when not in use. The "Allen" name is a registered trademark, originated by the Allen Manufacturing Company of Hartford, Connecticut circa 1910, and currently owned by Apex Tool Group, LLC. Its genericised use is discouraged by this company. The standard generic name used in catalogues and published books and journals is "hex key". Explained by the geographical and commercial history of the drive type's development, the term "hex key" is best known as "Allen" in the USA (The “Allen” name is a registered trademark, originated by the Allen Manufacturing Company of Hartford, Connecticut circa 1910, now owned by Apex Tool Group, LLC, which was acquired by Bain Capital in 2014), and also in Spain (llave Allen pronounced with Spanish double L, /ʎaβe aʎen/), as "Inbus" in Germany (the term “INBUS” is a registered trademark, originally an acronym for Innensechskantschraube Bauer und Schaurte introduced in 1934 by the German company Bauer & Schaurte, in 2015 acquired by INBUS IP GmbH, Breckerfeld, Germany), and as "Unbrako" key or wrench in Scandinavia (originally a Pennsylvania company established in 1911, in 2008 acquired by Deepak Fasteners Limited). In Italy, it is known as brugola, for the company Officine Egidio Brugola (established 1926). The term "hex-head" is sometimes used to refer to this type of drive, but this use is not consistent with its more conventional use referring to external-wrenching hexagons. In the fastener industry, the terms "socket head" or "hex socket head" are generally used for the driven part of the driver–driven pair. A less common synonym is "female hex". The tool allows the use of headless and recessed-head screws. The screw can be held by the key while it is inserted into its hole. The torque applied to the screw is constrained by the length and thickness of the key. The tool is very cheap, so it can be included with products requiring end-user assembly. The tool can be reconditioned using an electric grinder by removing the worn-out part near the end. It is much more difficult to turn a damaged internal fastener than an external one. Allen Manufacturing Company Inc advertisement for the Allen Safety Set Screw, a brand of set screw, in the Automobile Trade Directory, January 1913. The scant documentation available indicates that the idea of a hex socket screw drive was probably conceived as early as the 1860s to the 1890s, but that such screws were probably not manufactured until around 1910. Rybczynski (2000) describes a flurry of patents for alternative drive types in the 1860s to the 1890s in the US, which are confirmed to include internal-wrenching square and triangle types (that is, square and triangular sockets) (U.S. Patent 161,390), but he explains that these were patented but not manufactured due to the difficulties and expense of doing so at the time. P. L. Robertson, of Milton, Ontario, Canada, first commercialized the square socket in 1908, having perfected and patented a suitable cold forming method, using the right material and the right die design. In 1909–1910, William G. Allen too patented a method of cold-forming screw heads around a hexagonal die (U.S. Patent 960,244). Published advertisements for the "Allen safety set screw" by the Allen Manufacturing Company of Hartford, Connecticut, exist from 1910. Although it is unlikely that Allen was the first person to think of a hex socket drive, his patent for a manufacturing method and his realized product appear to be the first. In his autobiography, the founder of the Standard Pressed Steel Company (SPS; now SPS Technologies, Inc.), Howard T. Hallowell Sr, presents a version of events in which SPS developed a hex socket drive in-house, independently of Allen, circa 1911. From this came the Unbrako line of products. This account from Hallowell does not mention the Allen patent of 1910, nor the Allen safety set screw product line. Hallowell does describe, however, the same inspiration also mentioned in connection with Allen for a wave of adoption of the hex socket head, beginning with set screws and followed by cap screws. This was an industrial safety campaign, part of the larger Progressive Movement, to get headless set screws onto the pulleys and shafts of the line shafting that was ubiquitous in factories of the day. The headless set screws would be less likely to catch the clothing of workers and pull them into injurious contact with the running shaft. SPS at the time was a prominent maker of shaft hangers and collars, the latter of which were set in place with set screws. In pursuit of headless set screws with a better drive than a straight slot, Hallowell said, SPS had sourced set screws of square-socket drive from Britain, but they were very expensive. (This was only 2 years after Robertson's Canadian patent.) This cost problem drove SPS to purchase its first screw machine and make its screws in-house, which soon led to SPS's foray into fastener sales (for which it later became well known within the metalworking industries). Hallowell said that "[for] a while we experimented with a screw containing a square hole like the British screw but soon found these would not be acceptable in this country [the U.S.]. Then we decided to incorporate a hexagon socket into the screw […]." Hallowell does not elaborate on why SPS found that the square hole "would not be acceptable in this country", but it seems likely that it would have to have involved licensing Robertson's patent, which would have defeated SPS's purpose of driving down its cost for internal-wrenching screws (and may have been unavailable at any price, as explained at "List of screw drives > Robertson"). The story, if any, of whether SPS's methods required licensing of Allen's 1910 patent is not addressed by Hallowell's memoir. The book does not mention which method—cold forming or linear broaching—was used by SPS in these earliest years. If the latter was used, then Allen's patent would not have been relevant. Soon after SPS had begun producing the [hex] socket head set screw, Hallowell had the idea to make a [hex] socket head cap screw (SHCS). Hallowell said, "Up to this moment none of us had ever seen a socket head cap screw, and what I am about to relate concerns what I believe was the first socket head cap screw ever made in this country [the U.S.]." SPS gave their line of screws the Unbrako brand name, chosen for its echoing of the word unbreakable. Hallowell said that acceptance of the internal-wrenching hexagon drive was slow at first (painfully slow for SPS's sales), but that it eventually caught on quite strongly. This adoption occurred first in tool and die work and later in other manufacturing fields such as defense (aircraft, tanks, submarines), civilian aircraft, automobiles, bicycles, furniture and others. Concerning the dissemination of the screws and wrenches, Hallowell said that "the transition from a square head set screw [Hallowell refers here to the then-ubiquitous external-wrenching square drive] to a hexagon socket head hollow set screw[,] for which had to be developed special keys or wrenches for tightening or loosening the screw, was the cause of more profanity among the mechanics and machine manufacturers than any other single event that happened. […] I am sure that the old-timers who read this book will remember this period vividly." (These transitional growing pains echo those experienced many decades later with the adoption of the Torx drive). It appears that the internal-wrenching hexagon drive may have been independently reinvented in various countries. At the least, the design (or methods of manufacturing it) was patented in various countries by various patentees, and its name varies. There is another name in Italian (brugola), stemming from the name Officine Egidio Brugola, a company who first commercialized Allen's products in Italy. Hex keys are measured across-flats (AF), which is the distance between two opposite (parallel) flat sides of the key. Using a hex wrench on a socket that is too large may result in damage to the fastener or the tool. An example would be using a 5 mm tool in a 5.5 mm socket. 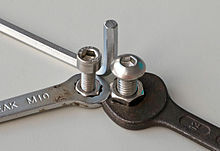 Because hex-style hardware and tools are available in both metric and Imperial and customary sizes (the latter sometimes labelled "SAE"), it is also possible to select a tool that is too small for the fastener by using an Imperial/customary tool on a metric fastener, or the converse. There are some exceptions to that. For example, 4 mm keys are almost exactly the same size as 5/32", and 8 mm keys are almost exactly the same size as 5/16", which makes 4 mm and 8 mm preferred numbers for consumer products such as self-assembly furniture, because end users can successfully use an imperial key on a metric fastener, or vice versa, without stripping. 19 mm keys are so close to the same size as ¾" that they are completely interchangeable in practical use. 2 to 6 in 0.5 mm increments, sometimes incorrectly referred to as M2 to M6 which rather should refer to thread sizes (see below for M1, M2 style designation). 24, 25, 27, 30, 32, 36, 42 and 46 mm. Metric hex wrench sizes are sometimes incorrectly referred to using the designation "M" followed by the size in millimeters of the tool or socket, e.g. "M6", although this may be confused with the standard use of "M6" which refers to the size of a metric screw or bolt. Table of some common metric hex key sizes from 0.7 to 10 mm. Italic values are rounded. 2nd choice sizes are rarely used. American sizes are defined in ANSI/ASME standard B18.3-1998 "Socket Cap, Shoulder, and Set Screws (Inch Series)". Table of some common SAE hex key sizes from 0.028" to 3/8". Italic values are rounded. Note that numerous other sizes are defined; these are the most common. 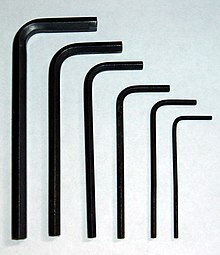 Hex keys of various sizes with ball ends. A security version of the hex head includes a pin in the center. These fasteners are said to have a "center pin reject" feature to prevent standard hex wrenches from working. A special driver must be used to fasten or remove these fasteners. The TORX head's security variant also has such a pin for the same reason. Some hex keys have a ball on one end, which allows the tool to be used at an angle off-axis to the screw. This type of hex key was invented in 1964 by the Bondhus Corporation, and is now manufactured by several other companies. While providing access to otherwise inaccessible fasteners, thinning of the tool shaft to create the ball shape renders it weaker than the straight-shaft version, limiting the torque that can be applied. The tool also makes point contact with the fastener as opposed to the line contact seen in the straight style tools. Hex socket screw heads are usually made by stamping the head with a die, plastically deforming the metal. Other ways to generate the hex socket include linear broaching and rotary broaching. Broaching the heads with a linear broach is essentially the metalworking analog of mortising wood with a mortising machine; a hole is drilled and then the corners are broached out. This operation often leaves little telltale curled chips still attached at the bottom of the socket. These are negligible for most applications. Hex keys are made by imparting the hexagon cross-section to steel wire (for example, with a drawing die), then bending and shearing. ^ INBUS IP GmbH, Breckerfeld, Germany was registered on 27 August 2015 (Amtsgericht Hagen Aktenzeichen: HRB 10066), formerly Fabelhaft Werkzeug UG. Fabelhaft Werkzeug acquired the trademark from RT Holdings III WG (US), LP, Luxembourg, on 24 July 2015. INBUS IP GmbH was registered with the stated purpose of holding and licencing the trademark INBUS. In late 2015 to early 2016, the company sent out desist orders to companies using the name "Inbus" for hex keys. M. v. Hohenhau,  (fachanwalt-it.blogspot.com) Abmahnung Fabelhaft Werkzeug UG (ratgeberrecht.eu, 26 November 2015). Abmahnung INBUS IP GmbH (ratgeberrecht.eu, 15 January 2016). Hex keys with the INBUS brand are now manufactured at HaFu Werkzeugfabrik H. J. Fuhrmann GmbH, Breckerfeld, North Rhine-Westphalia, as of 2017 accounting for 7% of the company's EUR 8 million turnover. Jens Bergmann, Inbus-Schlüssel (brandeins.de, 2018). ^ Alloy Artifacts, Various Tool Makers (section on Allen Manufacturing Company), archived from the original on 2011-12-30, retrieved 2012-01-25. ^ Hallowell 1951, pp. 51–52. ^ Hallowell 1951, p. 51. ^ Hallowell 1951, p. 52. ^ Hallowell 1951, p. 57. ^ Hallowell 1951, pp. 54,57–59. ^ Hallowell 1951, p. 54. ^ Burton 1946, p. 149. Burton, Walter E. (February 1946), "Hold Everything", Popular Science, New York, NY, USA, 148 (2). Wikimedia Commons has media related to Hex key.